History is all around us. 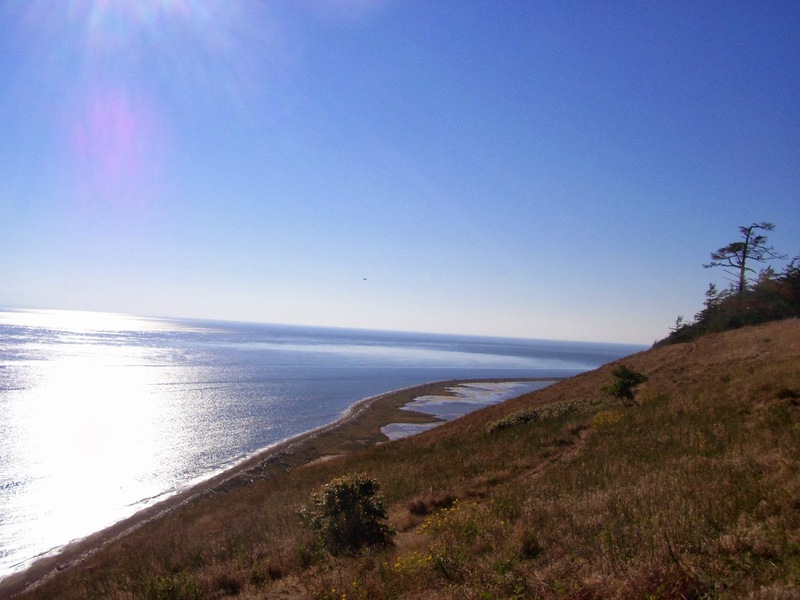 Even the smallest town no one has ever heard of, one that didn’t make the pages of high school history books, contains some piece of history. So it is where I live, too. The history I’m intrigued by, the history that constantly draws me, can be found not far from where I live and work. It is, in fact, one of the places where I find inspiration as I write. That place can actually be found here, on the cover of my first novel. When asked for my ideas for the cover of my book, I submitted a picture I’d taken of the lighthouse that I featured in my book (under a fictional lighthouse name). 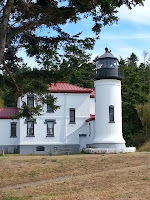 Admiralty Head Lighthouse not only inspired parts of my first novel, it’s the inspiration for a historical novel I’m currently in the process of fleshing out – while I finish up a few different writing projects. Truthfully, I’m eager to finish these other projects so I can get to work on this one, but there are only so many hours to go around. So it may be quite a while before I can work on this historical idea. In the meantime, I wanted to share this wonderful place with you in the hopes that it might inspire your imagination as well. I had actually planned to share this with you earlier in the year, but that brings me right back to my old nemesis named Time. Before I go any further, I want you all to know that I have a fairly healthy fear of heights. Therefore, you should all know of the enormous sacrifice I made in order to share this with you. Now granted, I'd been in the lighthouse many times as a kid and never was afraid. But I'd only been once as an adult, and it was more than twenty years ago. When you climb the steps of the lighthouse, you're faced with a decision to climb up to the tower, or enter the house itself. It was the tower itself, and the magnificent view, that I want to share with you today. This is where I first stepped into the tower. Nothing to be frightened of, yet. But butterflies were already taking flight in my stomach. Luckily for me, no one was around to notice. I climbed a little further and was soon able to look out the window. No big deal, really, until I looked down to see my progress. Okay, it may not seem like much to you, but right here, I had to lean against the wall and try to still my quaking knees. Seriously. They were shaking like a teacup in an earthquake. Still, I'd come this far, I needed to look up and step forth. As I climbed higher, I turned again to photograph my progress. My vision swam in and out of focus as I saw this, and I almost dropped my camera. But the worst was yet to come, and if it was a mistake to look down it was most assuredly a mistake to look up. I'm not sure how to explain this other than to say that once the circular steps run out, there is a ladder that goes up into the floor of the viewing deck. There is no handrail going up the ladder. I've never heard of anyone falling from here before, and I sure didn't want to be the first. But...I'd come this far and I was determined to finish. It was about more than sharing this with you. My pride was at stake now. It should also be noted that there is nothing to pull yourself through when you reach the top. You just have to crawl across the floor until you're at a safe distance away from the opening. That view alone made my knee-quaking trek worth it, until I turned to leave. But it was all worth it, don't you think? I think so, too. But I don't see myself doing it again in the near future. Susan Diane Johnson recently sold her third novel, and first historical, Sweet Mountain Music, to WhiteFire Publishing. Her first two novels, True North (January 2014), and No Substitute (available now), are both contemporary inspirational novels with The Pelican Book Group. Suzie lives on an island in the Pacific Northwest with her husband and their naughty little cat. They are the proud parents of a wonderful grown son. 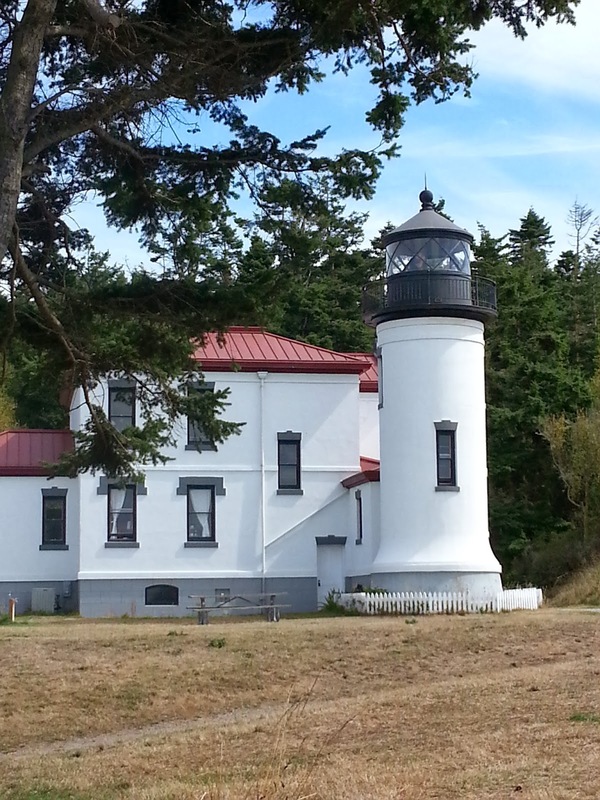 Thanks for showing us your lighthouse adventure, Suzie. I should keep this for the next time someone says I should wear skirts more often. Ha! I think I'd be okay with the stairs but the ladder would be challenging! However, you're right! The view is amazing! Elaine, that ladder was crazy. I literally prayed my way up and was so thankful when I reached the floor. My germophobia took a backseat to my fear of falling. I love this, Suzie. I'm a big fan of finding and using local history. It provides a wealth of material, and it's easier to make it come alive when you can BE there. I think I could handle going UP, but going down would be a challenge. Thanks, Niki. I've found a lot of awesome research books at the historical society, too. Going down is definitely harder because I get that weird feeling of being pulled forward. I have to say the steps look JUST LIKE my favorite lighthouse in OBX. I don't suppose there's a lot of room for variety! Hooray for you to finish. I'm okay with going up, just not stepping out on the outside which I had to do at the Currituck LIght in Corolla NC. Plus it was windy. Argh!! Deb, I lost my note to you. I hope I can visit your lighthouse in the OBX someday. In my lighthouse, you can't step outside. But if you could, I don't think I could bring myself to do it. Lovely view and such a cool place! But I'd probably be quaking a bit, too. I LOVE heights, but there's something about little ladders I don't like. DeAnna, I think all ladders should have a hand grip. Maybe then it wouldn't be as scary. Wait a minute. Wait. A. Minute. Did you just say you LOVE heights? Wow. I've never met anyone who loved heights. How are you with roller coasters? Love them. They're a little hard on my back these days, and I'm always terrified when I'm riding, but ready to go again when it's done.